A couple months ago when I was working in my friends bakery, he was making Rugelach. I was going crazy because this is quite possibly my favorite cookie. Like seriously. I know I say that all the time, about all my recipes, but this is one cookie that I cannot eat just one. 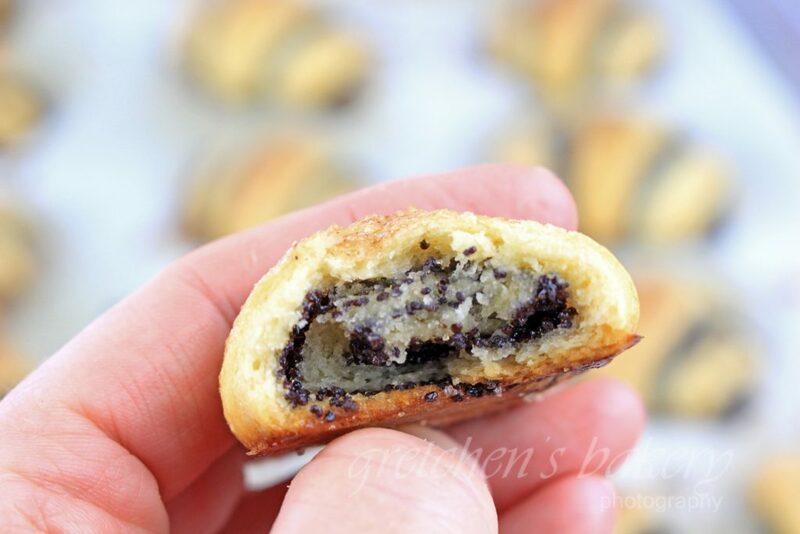 When there are rugelach in the house, you better hide them from me because they will be gone in an instant. You know how you can’t ever just eat one Dorito? I did two varieties, one is the Chocolate Raspberry and the other is filled with Poppy seed spread. 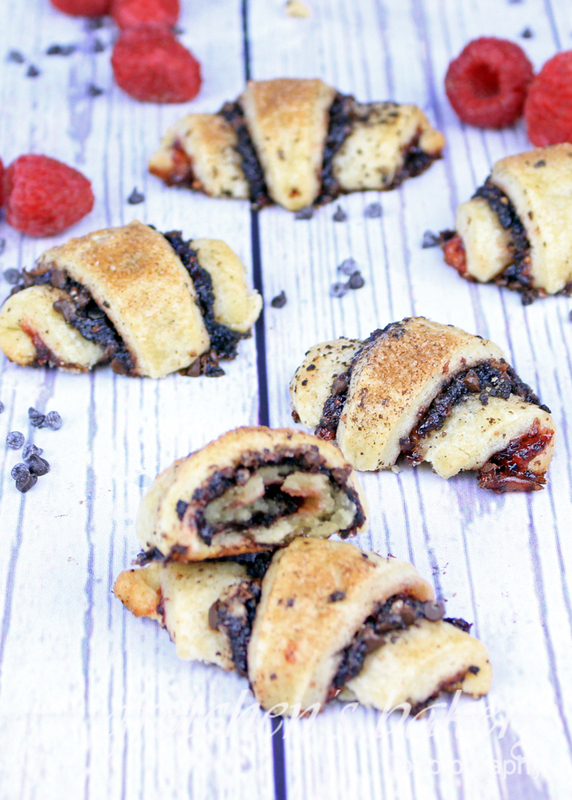 If you have never worked with Rugelach dough you are in for a treat. It is super silky and really easy to work with. The cream cheese in the dough makes it so soft and actually it is what makes this dough so unique. If you are not familiar with what a Rugalah cookie is, when you taste one, you will wonder what is that back note of creaminess that is so surprising in a cookie! Yep, that’s the cream cheese. Well enough of me talking about them, check out how easy it is to make them and don’t forget if poppy seed or chocolate raspberry is not your favorite you can fill these cookies with anything you prefer! Apricot is another very popular variety as well as the walnut cinnamon kind! Get creative and make these your own signature cookie! I think I like it! It’s been working really well in my cakes and cookies, so more about that in future recipes. The original recipe for this cookie dough called for egg yolks which I replaced with Vegan Egg by Follow Your Heart. I understand not everyone can get that product so I also tested it with The Plant based Egg by Freely Veganwith excellent results. You may see that I am using The Plant Based Egg by Freely Vegan as the egg replacer in almost all of my desserts now. If you do not want to buy it or cannot get it, you can sub in another proprietary blend egg replacer of your choice( results may vary slightly since I have not tested it with ALL the egg replacers). Add the granulated sugar and beat on medium speed until light and fluffy approximately 3 minutes. Sift the flour with the baking powder then add it all at once to the mixer and mix on low speed to combine. Wrap the dough into 3 separate equal discs and refrigerate for at least 2 hours or overnight. 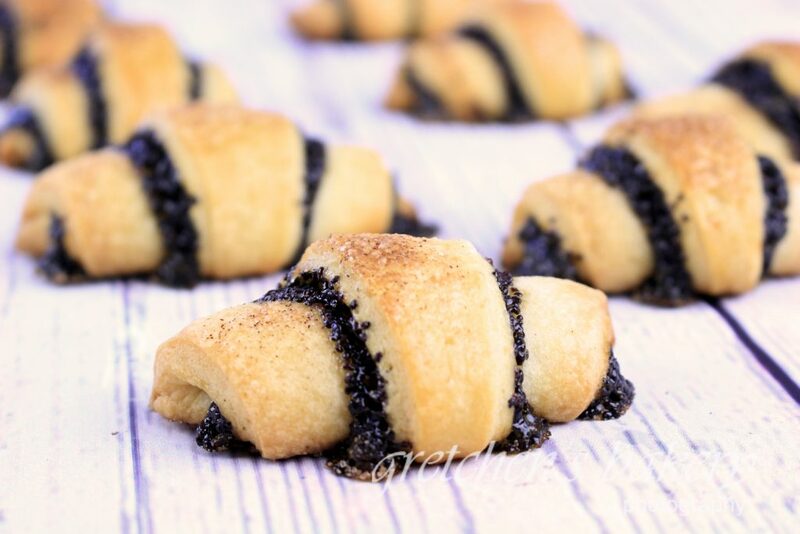 Please, let me know how did you make the poppy seed filling for this recipe and what ingredients did you use? Thank you in advance! !